Can't find 280Z emblems? 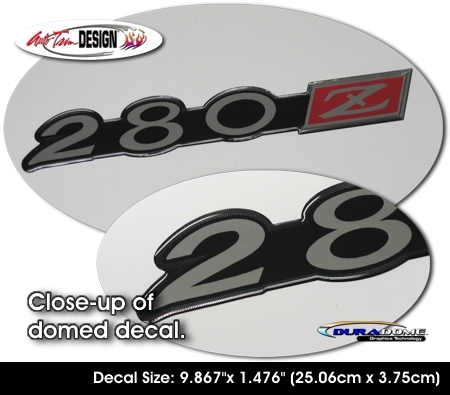 Enhance your Datsun 280Z with this "domed" decal set. "Domed" decals are not just vinyl decals. They are a tactile, three (3) dimensional decal that look like a factory manufactured emblem. Decals consist of domed pressure-sensitive Chrome Foil with our DuraCOLOR print in Black and Red as shown. Set comes with two (2) easy-to-apply domed decals and includes easy-to-follow general online instructions. While these are not the factory emblems, they are very close and look great on the vehicle. Get yours today! Domed decals are made upon your order. We hold them for three days to allow doming to cure.